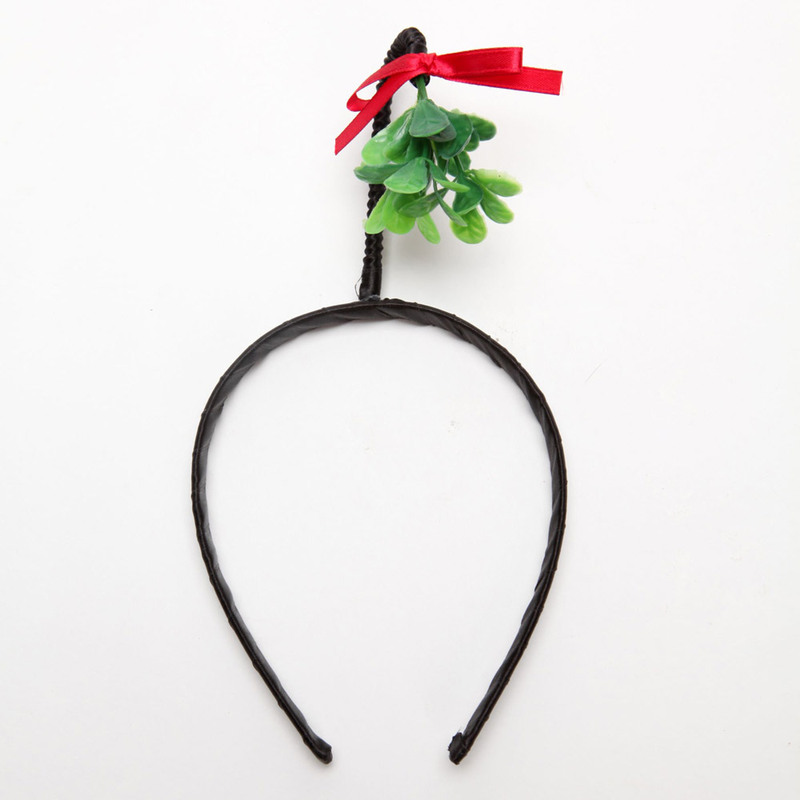 This is mistletoe. Note white berries and rounded leaves with smooth edges. I was browsing for mistletoe images today, thinking about possibly decorating the Pied Type header for Christmas. You wouldn’t believe the not-mistletoe images that came up. 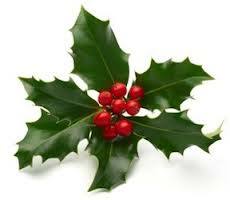 People, mistletoe is not holly (see picture below). It’s not pine, spruce, or fir. It has white berries, not red. Mistletoe is mistletoe. Period. 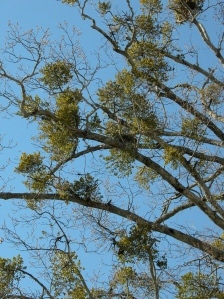 In Oklahoma, mistletoe grows high in trees like this. When I was little, kids with BB guns earned pocket change by shooting mistletoe out of the trees and selling it. Lacking a BB gun, one could sometimes get it by climbing the tree or by throwing something at or over the clumps of mistletoe. It grew prominently in the hackberries on our street, and everyone had mistletoe hanging in one or more places in their home during the holidays. I haven’t noticed how much real mistletoe is gathered and sold these days. 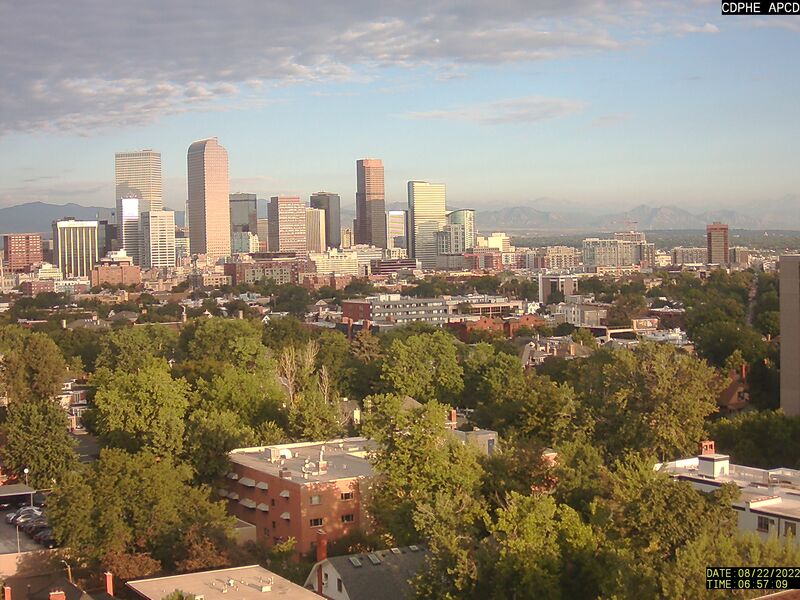 Purists probably still use the real thing, along with their real Christmas trees. 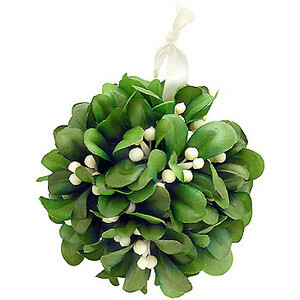 Personally, I think plastic mistletoe is prettier and it doesn’t dry into a sad, withered yellowish green. It’s also much, much safer. Real mistletoe is toxic to pets and children and should not be in a home with either. Note red berries and prickly leaves.